Software-as-a-service (SaaS) enterprise resource planning (ERP) is accelerating as a mainstream delivery model to help companies gain flexibility and leverage modern cloud technologies. The market landscape is evolving as pure-play SaaS ERP providers battle traditional ERP vendors that are repositioning their offerings for the cloud. Businesses should assess the viability of their current ERP deployments and consider the rapidly changing ERP landscape as they plan a transition path to the cloud. 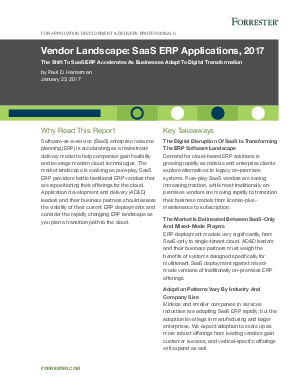 Review the Forrester report, “Vendor Landscape: SaaS ERP Applications, 2017” to hear how the ERP market is changing and how businesses are reconsidering deployment models to better fit their goals and needs. Epicor is listed among the mixed-mode vendors that offer ERP deployment flexibility. Customers can choose an on-premises model if it’s the best fit for their business. You can choose a cloud subscription model if it better fits your needs. Epicor also provides easy transition between models, so as your needs or goals change, your deployment approach can change with it. Find out what all of this means for the future of your ERP system. Download the Forrester report today, and learn how the growing cloud ERP landscape can fit your business.